Mylar® (registered by DuPont Teijin Films) is a strong polyester/plastic film that was developed in the 1950s, originally for industrial use. It is used instead of cellophane as it is much stronger and more resistant to heat. There are different types, finishes, and thicknesses available. The original uses include food packaging, gift wrapping and other industrial forms. The word Mylar® is often used generically referring to any type of plastic film, particularly those used for gift wrapping. This is what is used by crafters. You can find Mylar® that is suitable for embroidery in the wrapping paper departments of many (craft) shops and online sites. It is a shiny opalescence gift wrapping tissue that comes on a roll or is flat-packed. The Mylar® used in metallic balloons is not suitable for embroidery. It is advisable to test your wrapping before stitching, as the Mylar® intended for gift wrapping may not be suitable for washing (and often you want to be able to wash your creations you've made on your embroidery machine - i.e. when you embroider a design on a shirt). Please also be aware that if the source is not licensed you cannot be sure that the chemicals used in the manufacturing process are non-toxic. Be particularly aware of this if your project is intended for children. The Mylar® sold as suitable for embroidery can be washed repeatedly. Why use Mylar® with embroidery? Using Mylar® with your embroidery creates a glittery, sparkly effect and is cheaper and easier to work with than metallic embroidery thread. And it isn’t itchy when embroidered on clothing as it’s only on the front of the garment. 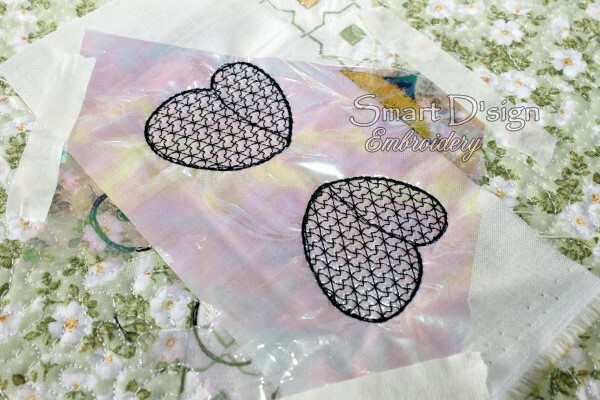 Can I use any embroidery design with Mylar®? Not really. There are specific designs for Mylar®, which are more open style fill, or motif stitch fill, even lace designs can be used. The designs embroider over the Mylar® and hold it in place but still let the Mylar® sparkle through. Can I stitch Mylar® designs without Mylar®? Yes. You stitch can stitch the designs directly onto fabric without the film. 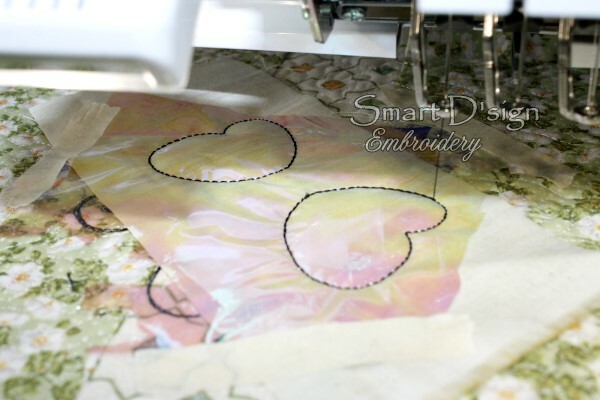 Just leave out the applique steps specific to the Mylar®, and/or just add an applique fabric instead. Mylar® designs tend to have a vintage look when stitched directly onto fabric without Mylar®. Some may however look sparse in places where the background fabric shows through. If you are not sure, just experiment to see when it is interchangeable. Where can I buy Mylar® Embroidery Film? Where can I buy Mylar® Machine Embroidery Designs? You can buy Mylar® machine embroidery designs right here in my shop. I'll constantly adding new designs to this section of my shop, so please come back every now and then to check on new designs. Or make it even easier, never miss out on our latest specials by either following us on our Facebook page or subscribing to our newsletter. I'll show you here, how you can use Mylar. 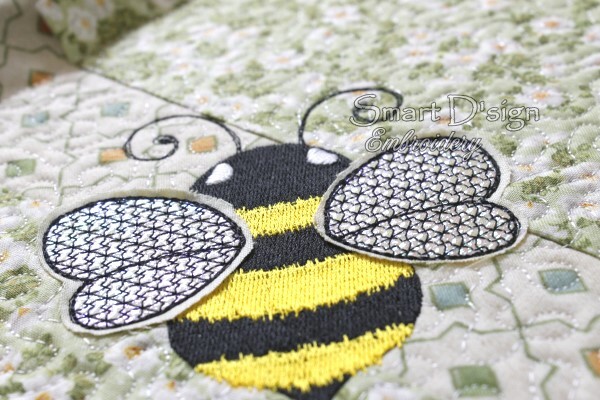 You can buy this design in my shop, search for 'Mylar Bee' in the category "Mylar Designs". 1. Stitch the design following the colour chart. 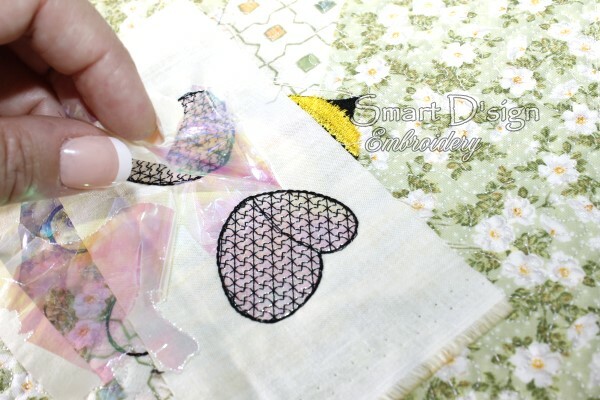 Stop when you come to the sequences for the Mylar applique. In this case the wings are done with Mylar. 2. Check the size of the piece of Mylar you'll need for the applique. 3. 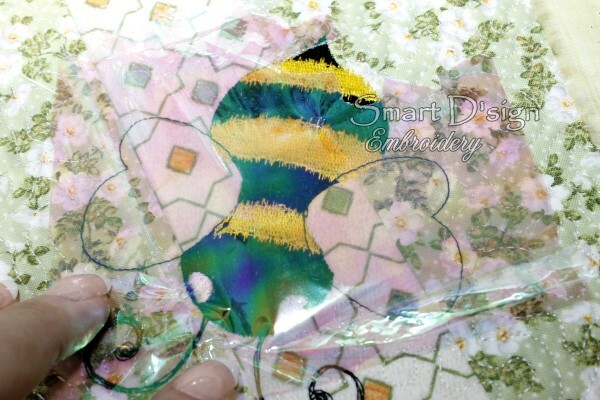 If you do not with to see the pattern of the carrying fabric shining through the Mylar place some uni-color fabric onto the applique outline (so using fabric for the applique is optional). 4. Then place the piece of Mylar onto the outline, covering it completely. 5. 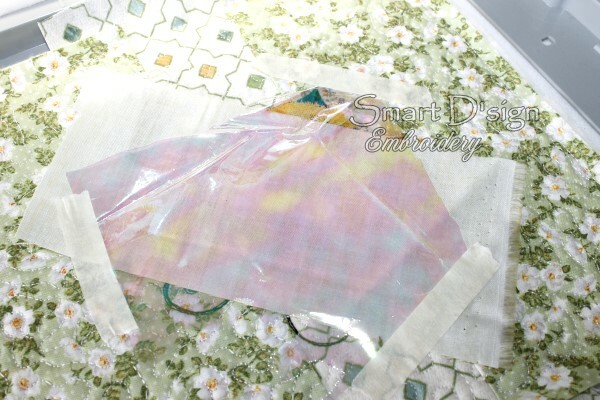 The next sequence will sew the Mylar (and the fabric) onto the project. 6. 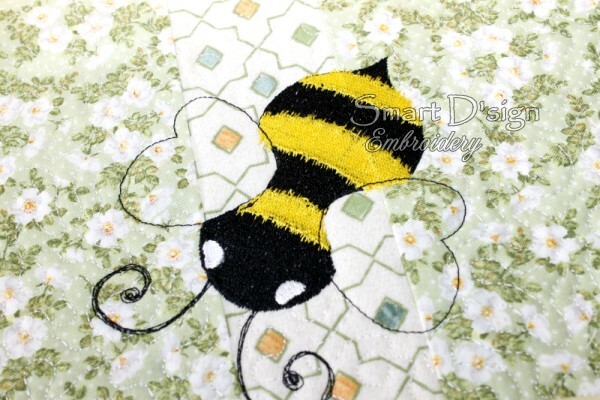 Finish the applique steps, which include the open fill stitch on the wings. 7. Tear away the Mylar film outside the outline. 8. 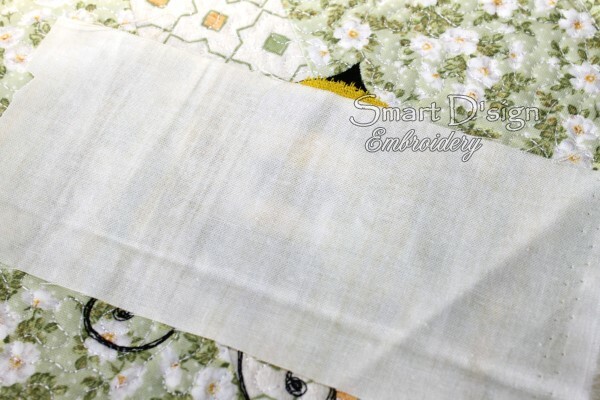 This design is a motif with raw applique, which means that no satin stitch will surround the applique edge. Cut away the fabric outside the outline with about 1 or 2 mm distance to get a raw edge look on your design (if the design has a satin border, then cut away the fabric and stitch the satin border as a finish). And there you go - your sparkling design is finished - and washable, if you have used the high quality Mylar®.